I’ve come across a couple of things lately that I want to share with you. Some of my clients are adding and subtracting GST using two calculations. I want to show you a way of doing it using one simple equation. To add GST to a net amount (that’s excluding GST), simply multiply the net amount by 1.15. This will add 15% to the net amount giving you a total gross amount, but you probably already knew that. 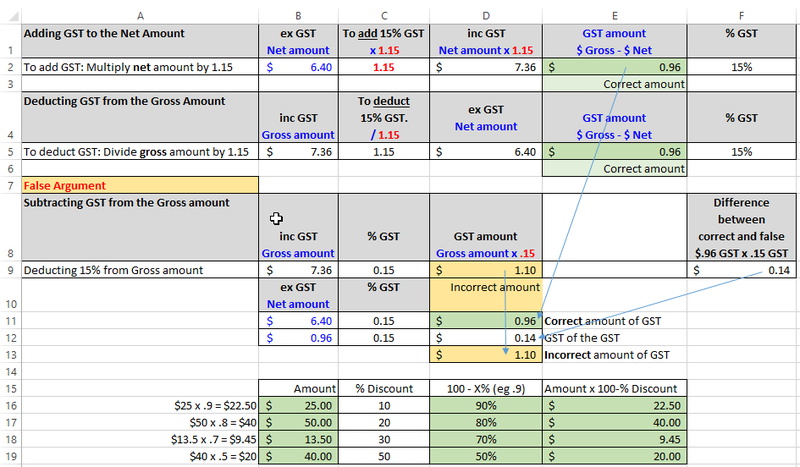 To Subtract GST, perform the opposite calculation by dividing the gross amount by 1.15. This will deduct 15% GST from the gross amount. I have prepared a simple table below to show examples. I’m showing you this because a few people perform an incorrect calculation by multiplying the gross amount by 15% then deducting this amount to show, what they think is, the net amount excluding GST. This is not correct because they are calculating 15% not only of the net amount (GST $0.96) but also, in addition, of the GST amount (GST$0.14) to equal GST$1.10. The GST amount is $0.96 not $1.10. i.e. 15% x 15%. See D11, D12 and D13 the table below for what I hope is a clearer explanation. This is a nifty calculation that you might want to show your children if they're taking business studies at college. I have worked in the dog grooming industry through my family business in Brazil since I was 12 years old. I have achieved a number of qualifications in dog behaviour, dog psychology and training along with qualifications for dog grooming and I will become a Master Dog Groomer in 2016, as part of a four year qualification. I settled in Mount Maunganui and started my own dog grooming business in 2006 after realising that a good business opportunity was possible. ShowDogsNZ started trading with a team of seven staff and a growing demand for a day-care service complemented by grooming services. We also introduced a pet supplies shop at our front reception offering a wide range of dog products. Today ShowDogsNZ is the largest dog grooming facility in the Bay of Plenty and I am responsible for operating all aspects of the business on a day-to-day basis including human resources tasks such as paying wages, organising holiday rosters, timesheets, banking and documenting all health and safety requirements with the help of two office managers. I started the business without a structured plan and succeeded with very hard work and a solid skill base. Competition in my industry started to arrive and I felt that I needed someone to give me some direction and help me to ensure my business would keep growing in this changing environment. I was referred to Dean Dalton by a consultant that I had been working with. Dean showed me a plan that seemed to answer both my questions and my needs. The main challenge in my business is the high overheads; staff, facilities, equipment and energy bills so calculating the right pricing was a central aspect of assessing the viability of my activity. Using the DaltonPlan® Benchmarks for my industry has helped me to get the figures right. As a consequence I adjusted my prices to reach financial sustainability. After working with Dean's financial tools, we looked at the organisational ones. For example, to increase profitability, we needed to increase efficiency. Being in an industry that requires a lot of staff, using the flow charts can potentially make a big difference as they bring consistency, detailed guidelines and training support for all of us. Good staff management is critical and I will continue to refine and implement the flow charts so that we can improve processes from dealing with initial phone calls to presenting freshly groomed or well cared for dogs to their delighted owners at the end of the day. We completed the plan about two weeks ago and I look forward to implementing new strategies and processes. The main benefit that really captured my attention is being able to measure our performance to be able focus on developing my business in the right direction. It has been a great experience working with Dean and we have established a good communication channel. I know that I can call him anytime if I have a problem and he'll be able to help. I will definitely look for ongoing support through this transition to help me to build on my well-established business.